When Young Modern sent this record to me, I was actually kind of surprised I didn't already have it. I'm not sure if I just didn't know it was released or if I knew about it at some point and never got around to ordering a copy. Regardless, I'm very excited to add it to the collection. We'll start up with Pink Wine. The first song on their side is "Wasted Breath." It's catchy in the right places with tinny, distorted guitar riffs and vocals that straddle the divide between snotty and melodic. It actually seems like the sort of band that would be pretty comfortable on Hozac. Their second song is a cover of Outtacontroller's "Put It On High." That is my favorite Outtacontroller song, so I am predisposed to already love that song. Pink Wine does a completely fine version. It's not too dissimilar from the original, but since I love the original, that's ok by me. Outtacontroller is the band I'm most excited about on the spit. I'm already a huge fan and I really feel like this is a band that doesn't get the attention they rightly deserve. They are just as amazing as any band playing catchy punk rock with big hooks and fuzzed out vocals. Their first song is "I Gave Up On Weezer" and it's as excellent as that song title would have you believe. It's certainly a topic I can relate to, but it's not just a gimmick song. It is as much of a toe tapper as anything else in the band's catalog. The second song is "Cold Sweats." It's a Pink Wine cover, though I wasn't familiar with original prior to hunting around for it on the Pink Wine Bandcamp page. It's a pretty faithful interpretation and a solid song. Compared side by side, I actually prefer the original by Pink Wine, but I dig the Outtacontroller version as well. I've always liked the idea of bands covering each other on split 7"s and this record is another example of why I tend to think it's a fun thing to do. 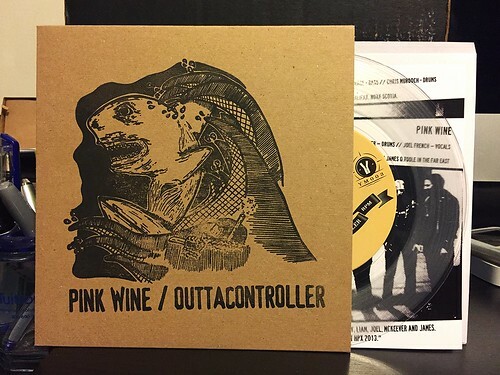 Pink Wine / Outtacontroller - Split 7"
Winter Bear - Jump In The Fire 7"
Cut Worms - Don't Want to Say Good-bye 7"
Heavy Times - Dancer 7"
Sun Of A Gun - Co-Pay 7"
Advlts - Black Bile 7"